Where does Batman get such wonderful toys? David Sherman can pick apart a Batman movie likefew can. And not just as it relates to the plot holes and poor performances. Sherman has an eye for detail when it comes to spotting what makes up the individual pieces of a character’s costume. For proof, look no further than the current exhibit at the Keizer Heritage Museum. It’s filled with bits and pieces of Batman movie nostalgia, including a few bits actually used on screen in the 1989 Batman movie. It’s all on display through April 29. 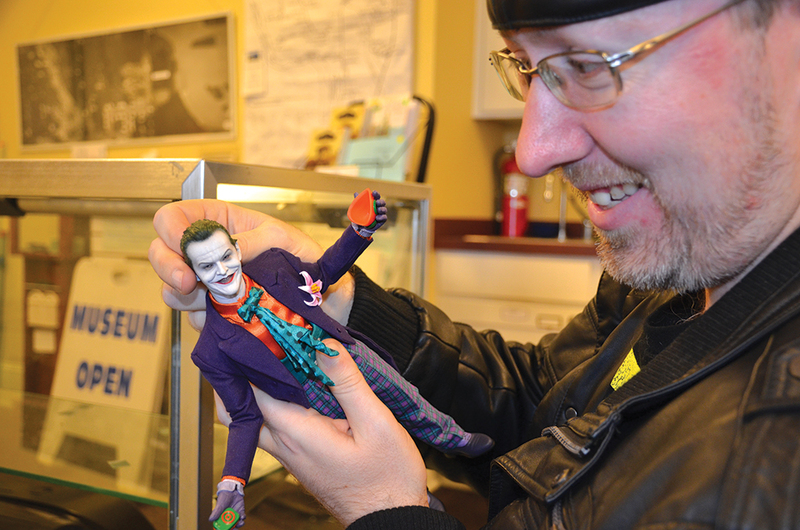 Sherman’s passion for movie props and costuming arrived at an early age with iconic special effects movies from the 1980s like the last two entries in the original Star Wars trilogy, Nightmare on Elm Street, Beetlejuice, Legend and Dark Crystal, but especially with the 1989 Batman movie featuring Michael Keaton as the caped crusader. He remembers vividly thinking he would one day have a Batman suit like the one Keaton wore in the film, but never would have suspected to find himself in possession of a full-scale replica and one of the suits actually used in the filming of the movie. The replica suit is one of several pieces on display in the exhibit, and it features components like the cape that were molded off pieces used during filming. “Now, there are whole communities who spend time building the costumes. The thing the internet gave us was access to people making the actual movies. It’s kept very private among collectors, but there is access to people who have the molds used for original productions,” Sherman said. In addition to the full-size batsuit, the exhibit features replicated bits and pieces from the more modern Christian Bale-led Batman productions – like utility belts, a grappling gun, batarangs, a Gotham City Police Department badge – alongside collectors items like action figures, a pinball board from the 1989 Batman pinball game and a one-third scale reproduction of the Keaton batmobile. There are also two items with Hollywood provenance: a pair of boots and a pair of long gloves used by Keaton during filming of his movies. “A lot of the pieces in the exhibit are replicas I put together from kits made by other people, like the utility belts from the (Christopher) Nolan Batman movies. Others are components I’ve worked on myself playing around with resin,” Sherman said. Sherman doesn’t just collect these items. In many cases, he’s actually worn them himself in charity appearances around the region and especially at Keizer’s own Tony’s Kingdom of Comics. He spent many years working on his own costumes, but he purchased a replica utility belt from an eBay seller several years ago who introduced him to the underground network of costuming enthusiasts. “Small groups of us will buy in to fund projects to get more and more screen-accurate pieces. They were crowdfunding things like these before crowdfunding was a thing,” Sherman said. Given the sometimes-fraught nature of online transactions, some gambles don’t pay off the way Sherman hoped, but others feel like windfalls. When he was putting together a Joker costume inspired by Heath Ledger’s performance 2008’s The Dark Knight, he wanted it to be as close to exact as possible. He found the company that produced Ledger’s socks for the role and ordered a pair for himself. He’s witnessed arguments over the precise color of the vest Ledger wore, and even found a clothier in Italy producing replicas of the suspenders used in filming. Those might seem like simple tasks, but consider this: the suspenders are only partially visible in a single scene of the movie. Sherman and his fellow enthusiasts take details like that to heart. The attention paid to detail is what gave him confidence when he purchased a production-used suit from the 1989 Batman film. Tony Grove, the owner of Tony’s Kingdom of Comics, sent him a cell phone shot of the timeworn suit with telltale details. While the suits in the film appear to be all black, what the audience sees is pleather glued over top of the white bodysuit. The suit’s age had given way to the white bodysuit and that’s how Sherman knew it was legit. “I was driving up to Portland when he sent the photos and I turned around and came back,” Sherman said. Not only did he purchase the suit, the Marion-Polk Food Share benefitted from a $1,000 donation from the sale Grove secured as a finder’s fee. While Sherman takes personal pride in his collection, it’s sharing it with others – whether he’s wearing it or not – that makes all the effort he goes to worth it. “I actually have difficulty finding places that want me to wear the Joker suit because some people think it will be too scary, but it’s not really about who the character is. It’s about the person wearing it, and I don’t think many kids find me all that scary when I show up in costume,” he said.